Scottsdale Stained Concrete Services by Barefoot Surfaces is your ticket to updating your floor. We have the tools and skill necessary in order to give your home the renewed look it needs. If you have been searching for a cost effective solution to upgrading your Scottsdale home and turning it into the luxurious sanctuary you have always wanted, look no further than Barefoot Surfaces. Our dedicated professionals can guarantee your satisfaction and give you the best flooring experience money can buy. With our Concrete Staining professionals, your floor will look brand new without the effort of buying new flooring and having installed with costly fees. Serving Scottsdale for over twenty years, our experts will repair and stain your concrete floor in a timely manner so that your home won’t turn into a construction zone for days on end, disrupting your life. Concrete floor staining is quick and will leave your home feeling like the luxurious haven you have always wanted. With our budget friendly services, you won’t be questioning whether or not our concrete staining services are for you. The Experts at Barefoot Surfaces know just how important your flooring is in your home. It can either tie everything together beautifully, or turn your house into a renovation nightmare with expensive repairs and upgrades that only make it worse. That’s why we are dedicated to giving you the most out of our concrete staining services. We can repair any damage that may have been done in the past, apply the stain of your choice, and also employ patterns and designs that are artful and beautiful, giving your Scottsdale home an upscale feel. With a variety of different patters, colors, designs, and finishes, you will be able to choose the right stained concrete flooring for your home. Perfect for every room, a properly done stained concrete floor will tie together any decor and turn your home into a luxurious sanctuary in which to relax. With flooring that goes with kitchens, living rooms, bathrooms, and more, concrete stained flooring is just right for any home to give it the updated look and appeal you want at budget friendly costs. Trust Barefoot Surfaces to get the job done right! Contact us today to find out more about our Scottsdale stained concrete services! 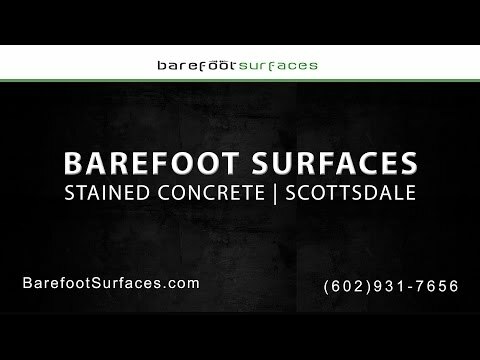 So come to Barefoot Surfaces for our excellent Scottsdale Concrete Staining services. Our friendly professionals will get the job done for you, with our budget friendly choices and top rated supplies and tools. Choose from our library of styles and designs, and you won’t be disappointed. So for more information about our top rated Scottsdale garage floor coating services, contact us today, and we will find the right coating that fits within your budget. We can make your decision effortless and make sure you fall in love with your floor at first sight.